It was all change for many of ITV's daytime shows on Monday, as production switched to their new temporary home at Television Centre. For Good Morning Britain's Susanna Reid, it was back to familiar ground, with the ITV Breakfast show taking up residence in the same building that was the home of her former BBC breakfast-time programme, before its move to MediaCity in Salford. The move, which has resulted in Good Morning Britain joining Lorraine, This Morning and Loose Women in taking up a five year residence at the refurbished Television Centre, follows ITV's decision to close The London Studios on South Bank as part of a major redevelopment of the site - some of which will be converted into housing. The departure from The London Studios at South Bank had been marked in recent weeks with multiple tributes and farewells across ITV programmes, from Saturday Night Takeaway to This Morning. Originally built for LWT and opened in the 1970s, the site became home to many of ITV's light entertainment and daytime shows through the decades, including Blind Date and SM:TV Live. 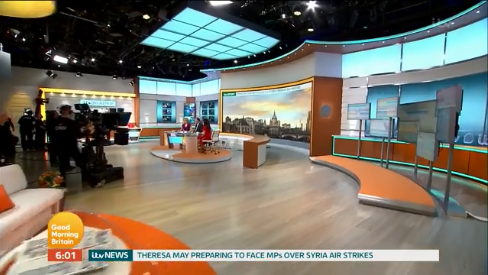 Many ITV shows have taken the opportunity to tweak their on-screen appearance with the change - with a new video wall for Good Morning Britain (shown above), a new look for Lorraine, but a familiar looking set for This Morning - albeit now with a fake window backdrop in the studio. On the first day of broadcasting from Television Centre, This Morning presenters Phillip Schofield and Holly Willoughby took the opportunity to take part of the show outside into the 'doughnut' in the middle of the complex. For viewers, all familiar faces remain, and casual viewers are not expected to notice much change. Television Centre - which until 2013 was the home of the BBC - has since been comprehensively refurbished. Although much of the site has been converted into housing and retail outlets, three studios remain on site. ITV Daytime will broadcast from the site until redevelopment work at South Bank is complete. Back at South Bank, the redeveloped ITV complex will include studio space for daytime TV, but no studio space for entertainment shows - these will find permanent alternatives at other sites, including Television Centre. The main BBC HQ has moved to New Broadcasting House, although the BBC's Studioworks unit remains responsible for the studios at Television Centre. Not just ITV shows are affected by the switch to Television Centre. BBC shows including Have I Got News For You and QI and C4's The Last Leg, all previously produced in The London Studios have had to move. Behind the scenes, ITV continues to have its headquarters on the South Bank, with playout of its channels from Chiswick and Leeds.